When you want great old-fashioned fun, family entertainment, the Paul Bunyan Lumberjack Show is where it’s at. Lumberjacks have been around for hundreds of years. At one time there were more than 500,000 lumberjacks in the United States alone. Lumberjacks were famous for resisting change and modern equipment, and for using their strength and athletic abilities to do the dangerous work of felling and preparing trees for domestic use. This culture of strength and danger has led to modern “lumberjack competitions,” like what you’ll see at the Paul Bunyan Lumberjack show. The Paul Bunyan Lumberjack Show has been performing at logging shows, sports shows, county fairs, festivals and theme parks for more than 28 years. They have performed all over the world — including in Japan, Europe and Africa. Top lumberjack competitors, known as “Timberjacks” or “Ironjacks,” participate from around the world. These are the same competitors you see on the Stihl Timber Sports Series, on ESPN and on TNN. Ironjacks compete in all of the lumberjack events, including log rolling, chopping, crosscut sawing, ax throwing, hot saw competitions and, of course, tree climbing. The Paul Bunyan Lumberjack show will give the audience lots of “timber history.” Participants show how logging skills were used years ago, and compare that era to today’s logging operations. For example, years ago lumberjacks used a crosscut saw to cut down their trees; but today, they use a chainsaw. In the Paul Bunyan Lumberjack Show, there’s a competition between a chainsaw and the old-fashioned muscle-driven crosscut saw: It’s a contest of muscle against machine. You’ll also see the lumberjacks use New Zealand speed axes to cut down a tree in a matter of seconds. This is real, tough competition at its best. 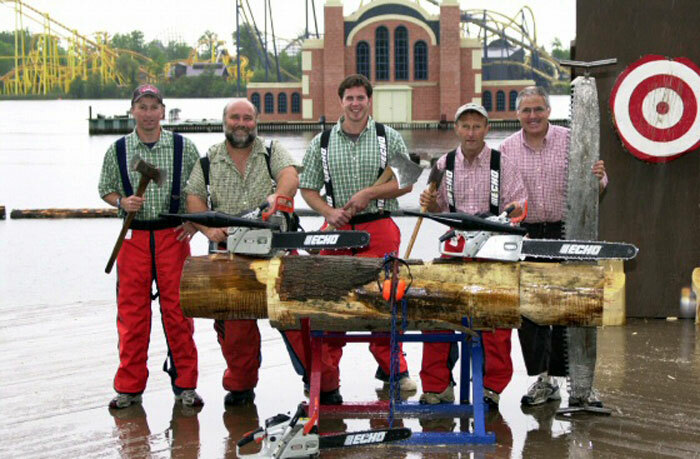 The Paul Bunyan Lumberjack Show is action-packed and full of fun for the whole family. Thanks to the San Diego County Ford Dealers for bringing it back to the Fred Hall Del Mar Show. The Paul Bunyan Lumberjack Show is scheduled twice a day at the Fred Hall Del Mar Show, March 21-24 at the Del Mar Fairgrounds. The show opens at noon Thursday and Friday and 10 a.m. Saturday and Sunday.